Of the original Seven Wonders of the Ancient World, only one wonder still exists today: the crumbling, gorgeous Great Pyramids of Giza. But there are plenty of other ancient structures that deserve our attention too, from a 2,000-year-old church to a more than 1,000-year-old Buddhist temple that's made out of timber. Even more remarkable? All of these building are still in use. Check out 17 of these tributes to human engineering, below. The Santa Sophia (also known as Hagia Sophia) in Istanbul, Turkey has been church, mosque and museum since it was completed in 537 AD. The Pantheon in Rome was built as a temple by Hadrian in 117 AD, and has been in continuous use throughout its history. It is one of the best-preserved of all Roman buildings, now a museum and Roman Catholic church. The church Santa Sabina in Rome, built in 422 AD, hasn't been changed since it was built, and is still in use by the Catholic Church. 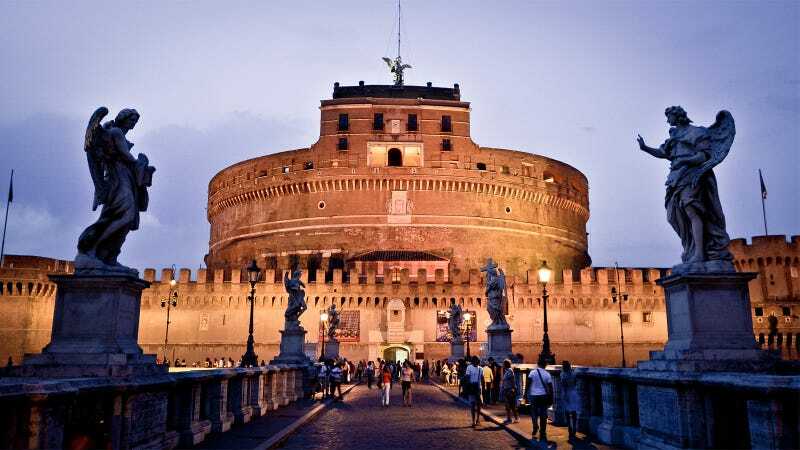 Rome's Mausoleum of Hadrian, usually known as Castel Sant'Angelo was completed in 139 AD and converted to a fortress around 400 AD. It's still a fortress (and a museum) today. The Colosseum once regularly hosted fifty thousand Romans, eager to witness the blood and violence of the legendary gladiators. Because of its ruined state, these days it can only hold a few hundred people on temporary plastic seats for (horribly overpriced) cultural events. Larger concerts and Roman Catholic events are also held outside, using the Colosseum as a dramatic backdrop. The Theatre of Marcellus once was Rome’s largest open-air theatre—built in the last years of the Republic. The building has undergone several modifications over its history, and today, the upper portion serves as apartments. Ponte Fabricio, in Rome, was built in 62 BC. The bridge is almost unchanged, and still serves thousands of Romans today. This is the Caravan Bridge over the river Meles in Izmir, Turkey. It was built around 850 BC, which makes it more than 2,860 years old—qualifying as the oldest functioning bridge in the world. Likewise, the Church of the Nativity (565 AD, Bethlehem, West Bank) is one of the oldest church buildings in the world—today, it still hosts multiple church services every day. The Proserpina Dam (Merida, Spain) dates from the first or second century AD, and once fed the Roman aqueduct taking water to a nearby city. This ancient Roman gravity dam is still used by local farmers to irrigate crops. Most of the thousand-year-old temples in Angkor, Cambodia, still serve religious function among the locals. The Nanchan Temple is a Buddhist temple near the town of Doucun on Wutaishan, in Shanxi Province, China. It was built in 782 AD, and its Great Buddha Hall is currently China's oldest preserved timber building in existence. The Basilica of Constantine at Trier, Germany is a Roman palace and basilica that was built at the beginning of the 4th century. Today it's used as church by a congregation within the Evangelical Church in the Rhineland. The Acoma Pueblo, also known as "Sky City," is a Native American pueblo located west of Albuquerque, New Mexico. Acoma tribal traditions estimate that they have lived in the village for more than two thousand years. The Mosque of Uqba (670 AD) aka the Great Mosque of Kairouan, Tunisia, is one of the oldest mosques in the world. The ancient Stonehenge is still a place of religious significance for Neopagan and New Age believers, and particularly for the Neo-druids. The Tower of Hercules is an ancient Roman lighthouse near A Coruña, Galicia, in north-western Spain. The structure is almost 1,900 years old and still in use today. This list is far from complete, and is surely missing a few notable buildings. Don't hesitate to post them in the comments!